I get my best ideas right before I fall asleep and right after I wake up. I don't know why. 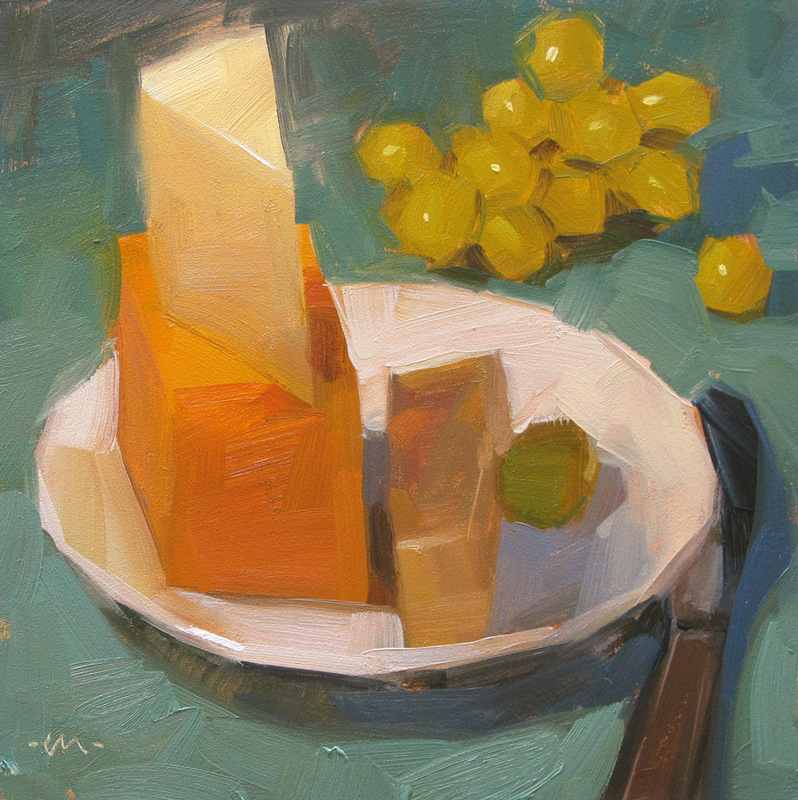 I had this idea recently, in bed, to paint little stacks of different kinds of cheese, paired with fruit. Why on earth was I thinking about this in bed?! At any rate, I was very excited to try it. And it turns out cheese has some lovely translucent qualities that are very interesting to paint. The only problem is after it sits out for a while it starts to ... "sweat" a bit. Hmmmm... right... and then you have 'sweaty' cheese for lunch! Same problem with donuts, sometimes the icing slides right off! Love the translucent sides of the cheese - who even notices that when we're eating? Probably that's why you thought of it while you were getting ready to sleep! 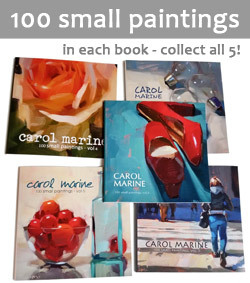 I know what you mean about the ideas right before sleep and waking Carol! The problem for me is I need to write it down before it's gone again. :) Love the soft colors of this. Another gem! Oh wow, Carol! Such loveliness! You captured the translucent qualities of the cheese perfectly. Your colors are inspiring. As usual, you amaze me!!! Good to know I am not the only artist that lays in bed thinking about their art. Very nice painting, your planning sure works for you. How you managed to capture the difference in consistency between cheese and grapes baffles me. Great job. That top triangle of cheese is wonderful, luminous with some real heft to it. Like you and several of your commentators, I, too, think about what and how to paint while in bed in the dark... when I should be sleeping!